Giving back is good business practice, no matter your size, location, or industry. Even small efforts resonate well with your consumers, and the sooner you get involved, the better. 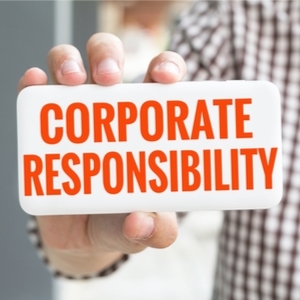 Corporate social responsibility (CSR) includes all practices businesses (big and small) take on to improve social, economic, and environmental conditions in society. CSR allows companies to give back while also helping their public image. Here are some things to keep in mind when evaluating your company’s CSR efforts. Companies often have a major initiative or organization they support. While this brand association with a cause is important, it’s also crucial to support charitable efforts your employees care about. Most companies encourage their employees to volunteer and even organize volunteer opportunities for them. This is great, but you could take things a step further by letting your employees give their input and help the organizations they care about. For example, consider allowing your staff/different departments to choose a charity and plan a volunteer event benefitting it each quarter. Not only is your business making a difference to the public, but your employees will feel valued and know their voice matters. While giving to national efforts and responding to large disasters is crucial, it’s just as important to be invested in local communities. Take part in community events, help out at a local school or food pantry, or discover what’s important to people in the area and invest in it. Making these important connections on the individual level will drive your image at the macro level. You don’t necessarily need to make a large monetary contribution to make a difference – your time can be just as valuable. Your business’s social media presence shouldn’t just be about driving sales or crisis communications. Keep your customers and stakeholders updated on social media and blogs by sharing photos of your volunteer efforts and updates about causes you care about. Highlight your employees on efforts they participate in both through your company and outside of it and tailor posts that align with your mission and values. Another aspect of corporate social responsibility is caring for the environment. Even small changes can a make a big difference in minimizing your company’s carbon footprint. Ensure you have a solid recycling program in place. More and more companies are also encouraging carpools, public transportation, or biking to work as greener travel options. It’s becoming easier to find ways to go green in your office from appliances, paper products, packaging and everything in between Shameless plug: TDS managedIP lets your employees be reachable from any corner of the earth. This means your office can be anywhere, saving gas (and rent money!). Every business finds different ways to implement CSR practices, but they all can be great in making a better relationship with your employees, customers, and stakeholders. Get creative in how you can give back and help your company make a difference.